REVIEW - 42092 - RESCUE HELICOPTER INTRODUCTION It feels like yesterday that TLG released a small rescue helicopter, but actually it dates back quite a few years. I'm talking about the 8068 - Rescue Helicopter released in 2011, packing 408 parts. In the 2010, one year earlier, TLG released an even smaller (152 parts) helicopter. The 8046 - Helicopter, which is clearly a rescue helicopter as well. With 325 pieces, the latest rendition lives somewhere between the 2010 and the 2011 version. Let's take off for the review. PICTURES Pictures can be clicked to view hi-res versions. More pictures can be found in my Flickr album. DISCLAIMER This set has been provided by the CEE Team of TLG. It's not my goal to promote this set. It's my goal to give you an honest opinion about it. Therefore, the opinion in this review is my own and is in no way linked to TLG. SET INFORMATION Number: 42092 Title: Rescue Helicopter Theme: Technic Released: 2019 Part Count: 325 Box Weight: 451 gram Box Dimensions: 28,0 cm x 26,0 cm x 5,8 cm Set Price (RRP): € 29,99 Price per Part: € 0,092 Links: Brickset, Bricklink THE BOX CONTENTS OF THE BOX The box contains: 1x Instruction booklet 1x Sticker sheet 4x Unnumbered bag BOOKLET STICKER SHEET BAGS HIGHLIGHTED PARTS The white Axle and Pin Connector looks new, but it has already been released last year. The white 7 x 3 Panel is new this year though. PART LIST The part list for all the 325 parts. COMPLETED MODEL The completed model captures the shape of a real helicopter very well. I was surprised by this. The landing gear has some white details, where you would expect black ones. I suspect this is because these parts are already being used in other sets in white this year. And they are being used in white in the tail of the helicopter as well. TLG tries to limit the number of different colors per set, and over the entire Technic range for a specific release period (e.g. 1H 2019). We have seen this strategy before. It probably has something to do with warehousing logistics and obviously optimising profit. When I get the chance, I will ask one of the designers/employees. The rear section opens up, but unfortunately the life-bed can't be stowed on the helicopter. This is minor gripe for me. Maybe TLG could have designed a different bed, which would fit in the rear. It feels kinda mandatory to be able to store the bed. The usual left-over parts. B-MODEL The B-model looks like something well worth building. It's a Concept Plane with moveable wings. SUMMARY I wasn't expecting much of this set, but it looks really nice for such a small helicopter. It has some playability and the opening rear doors are a cool addition. When I noticed the doors could open, I expected to be able to stow the life-bed (stretcher). Unfortunately this is not the case. It comes with a B-model which is interesting enough to build. It even has a cool feature (moveable wings). PROS Looks great Opening rear doors Winch Cool B-model Affordable CONS Life-bed doesn't fit the rear section of the helicopter Usage of obvious out-of-place (white) parts on the landing gear SCORE How do I rate this set? 8 DESIGN It captures the shape and looks of a helicopter really well. 7 BUILDING EXPERIENCE Fun to build, but nothing really special. 7 FEATURES The opening rear doors and winch are cool extra's. 7 PLAYABILITY It has swooshability, but the life bed doesn't fit the helicopter. 7 PARTS Mostly common parts and panels. 8 VALUE FOR MONEY The B-model looks interesting enough to build as well. 7,3 FUN ENOUGH TO KEEP THE KIDS BUSY FOR A WHILE FINAL WORDS Thanks you for reading this review. All pictures can be found here. Project Kenworth rotator tow truck. I wanted to show my latest project. It is a Kenworth rotator tow truck. I was really inspired by the one from Sariel. ( http://sariel.pl/2011/02/tow-truck-2/ ) And the one from Andrea Grazi. ( https://www.eurobricks.com/forum/index.php?/forums/topic/107317-an-ode-to-the-tow-truck-of-andrea-grazi-review-and-impressions/ ) It is still a long way before it is finished. But i wanted to share it anyway. Still working on the pneumatics and the rest of the crane and lift arm, to get everything working. Tell me what you think of it . Hi all, this week I started to make helicopters in the Westpac Life Saver Rescue Helicopter Service livery. They operate a variety of aircraft and I intend on making them all at some stage. The first MOC was the Eurocopter AS350 Squirrel which was easy enough. The helicopter was a quick re-paint of my police one with the only real changes being to the door configuration and the searchlight replaced by a loudhailer. The loudhailer is due to this aircraft's primary role of beach patrols. The second aircraft is the Kawasaki BK117 which was a bit more of a challenge. While this shares the same rotor diameter and length of the AS350, the cabin has a lot more room inside. Up to four minifigs can sit inside, or two with a brick-built stretcher (based on mista_carrot's design on flickr). Access to the cabin is through the pilots doors, 'sliding' doors and a clam shell door on the rear. I'll do a render to show the stretcher and inside of the cabin when I can. Let me know what you think and stand by for more. Edit: Here's the .LXF's for anyone who's interested Eurocopter AS350 westpac.lxf Kawasaki BK117 westpac.lxf For anyone trying to build the BK117, there's four illegal connections in the nose that aren't in the file. There's a technic pin with stud holding the cheese slopes for the chin windows and another two that form the connection that holds the lower part of the nose to the fuselage. Location: Arium Minor (F09) Tags: Building, Piracy, Civil -------------- Have you ever tried to walk silently with a peg leg? It's not easy, especially on metal flooring. But, in my business, you take whatever chance offers itself, whether easy or not. The Kawashita fleet had rendezvoused with an alien fleet, ostensibly for diplomatic purposes. Honestly, I didn't know much about why they were really meeting, nor did I care. All that mattered to me was the opportunity it presented. If we were planning on engaging in serious piracy, we needed a bigger crew - and I had a couple of people in mind. All I had to do was break them out of prison. "What've you got there?" "Prisoner transfer from the fleet," the arriving guard said. "Orders said the place is gettin' crowded, so these two'll be sharing a cell." "Hear that, lady?" the insectoid guard said. "An old friend's here to visit." "Well, well. Finally caught you, did they?" This was taking a long time. I needed one of the guards to come a little closer to me. "Step away from the door, witch!" the insectoid said. I heard his footsteps on the floot. Now. I choked up my grip on my staff and, as I stepped out, I swung it as hard as I could. My aim was good. The insectoid fell without a sound - dead or unconscious, I didn't know, nor did it matter. The prisoner dropped forward, out of the line of fire. The green-skinned female was rattled. Her one shot went wild - then I drilled her. She fell with a hiss. Definitely dead. I helped the bug out of his handcuffs, and we quickly moved the bodies out of the way. "Viktor Kramer! Can't say I expected to see you here," he growled. "Why did you come all the way out here? I doubt it was just for fun," the woman in the cell purred. "I've got a little proposition for you," I said. "Open this door, and let's discuss it." "I want you two to join my crew." "Piracy?" the bug said, twitching his mouthparts into what I guessed was a grin. "Privateering. We're working for the Kawashita Group, and I could use a few hands for the Variga." The woman shrugged. "What are we waiting for?" -------------- P.S. Not completely sure about the Piracy tag. Do rescued prisoners count as being "stolen"? [ MOC ] Medical Ship "White Whale"
When Tony Stark decides to leave the arm-dealing field, he sets up Stark Resilient, which aims to put his technology to the city to benefit the needed people. This time, he puts his arc reactor on the medical ship, and that helps reduce the transport time for patients to the hospitals and makes in-the-air surgery possible. The arc reactor engines are small and powerful, so that the ship can have more space for other uses. Tony meets the team of medical staff at the launch of new medical ship. Overview of the ship, which is quite bulky. Probably that gives people a more "caring and steady" feel for transporting the injured. Side view, and front view below. The cockpit has two seats, and the higher back one can be closed sideways so as to give access to the front seat. And yes, it is a little futuristic era to see the blue transparent panel. Maybe the front should have the same, now I realize! The top is the core of the energy source. The new repulsor engine in action. Normal; flipping out shields and turning backwards for rear thrust.... The back, which has two doors to ensure that the inside is sealed off from the outside, since this ship allows in-the-air surgery. The inside is a well equipped surgery room, with all the necessary medical supplies and tools. "Relax, and we will soon arrive at the hospital for a more thorough check." Thanks for checking! Presenting my Fire Fighting Train MOC. Fire fighting train is perfect for battling railway fires including in tunnels. It is equiped with dual high power nozzles, water and foam car, oxygen tanks, happy fire fighting crew. It is playable for ages 5 and up. Fire Fighting Train by dr_spock_888, on Flickr The equipment car has hose reel and cabinets for storage of oxygen tanks, masks, fire extinguishers, tools, etc. It is Power Function ready with space for IR Receiver and Battery Box. Battery box slots perfectly in between the storage cabinets. It is more capable than a CITY fire truck modified for rail service since the truck can't pull a passenger train out of a burning tunnel. Fire Engine MOD by dr_spock_888, on Flickr Don't forget to duck when going into tunnels. It doesn't look safe riding up there. Presenting my Rescue Train Car MOC I made this on suggestion from Lightningtiger that my fire train needed more cars. http://www.eurobricks.com/forum/index.php?showtopic=100199 Plus I like unique railroad equipment and am going through a "Train Age" in my LEGO life. zephyr1934 found a nice article on fire & rescue trains: http://wildfiretoday.com/2010/08/24/fighting-fire-with-a-train/ This MOC is based off a Swiss tunnel fire rescue train. The rescue car is used for evacuating passengers and the injured to a safe location while the fire equipment and water cars stay behind to fight the fire. My MOC has room for one minifig on stretcher, 3 sitting and 6 standing. Play features include crane for lifting stretcher, openable doors, drop down ladders/steps, and removeable roof for accessing interior. There is a cabinet to store medical and other supplies. Rescue Train Car by dr_spock_888, on Flickr Crane to lift patient stretcher onto car: Car interior: Rescue Train Car Interior by dr_spock_888, on Flickr Smiley fireman says I am here to save you. 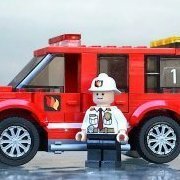 Hello, I am new here on Euro Bricks, but I have been building for some time and I have started a Fire dept. I was wondering what I could improve on and what is liked/ disliked. There are more, I just haven't gotten around to taking pictures of them..